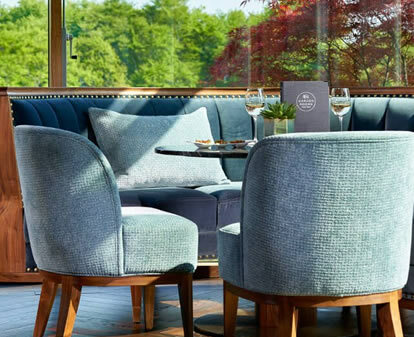 The Garden Rooms and Bar is the heart of the hotel, offering a calm, welcoming respite from the outside world, with stunning views overlooking the famous 13th hole on Druids Glen Golf Course. The Garden Rooms offer beautiful bespoke furniture, handmade in Ireland with a vibrant palette taking inspiration from the surrounding picturesque landscapes. The luxurious décor features dark green leathers, subtle blues with walnut and brass. The addition of a slight pop of colour and a range of textures including velvet and fabrics complements the magnificent setting. 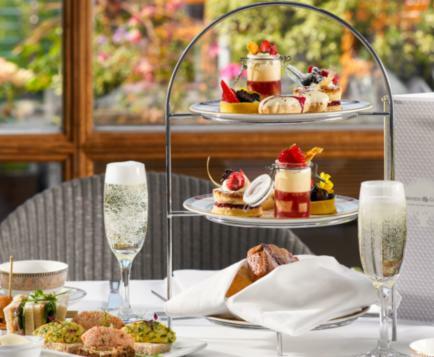 The impressive terrace completes the Garden Rooms and Bar and sets the scene for a relaxed and casual dining experience in the ‘Garden of Ireland’. Menus available daily from 10.00am - 10.00pm. 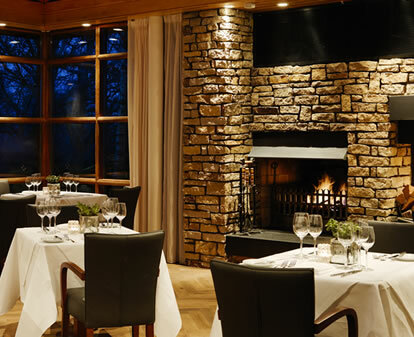 Druids Glen Hotel & Golf Resort's vegan dishes have been created in partnership with their neighbours at The Happy Pear. Read about their partnership. To make a reservation book online or call +353 1 287 0877. * Our vegan dishes have been created in partnership with our neighbours at The Happy Pear. 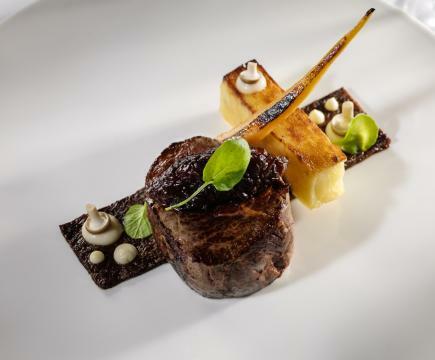 All dishes are served with chips and cherry tomatoes and a choice of the following sauces; brandy and peppercorn sauce, red wine jus or garlic and marrowbone butter. The chic interior of Hugo’s coupled with the bright and airy atmosphere and gorgeous woodland views makes for a lovely dining experience. Discover our newly opened Garden Rooms and Bar, right in the heart of the hotel, offering a calm, welcoming respite.